Palm Beach Currumbin has cemented themselves as one of the QAFL’s greatest ever teams by winning their second consecutive premiership against Broadbeach by 34-points on Saturday afternoon. 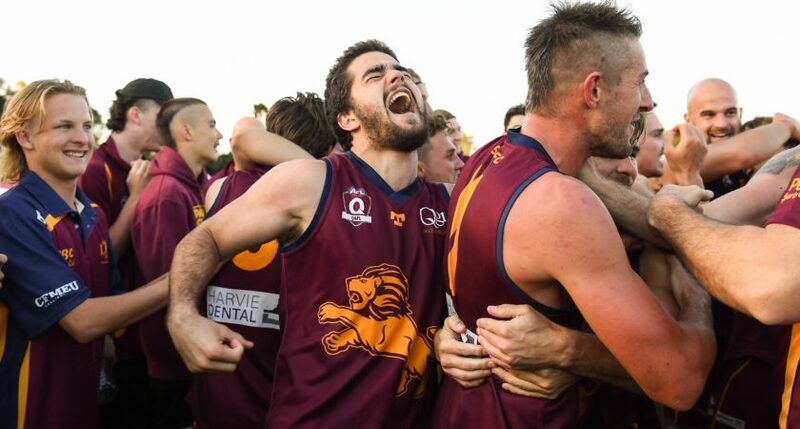 The Lions now find themselves among an elite group of teams to have claimed back to back premierships in the 21st century, joining just Labrador, Morningside and Southport to achieve the feat. The win for Chad Owens’ men didn’t come easy though, as the side were forced to withstand a spirited Cats outfit in the 14.16 (100) to 9.12 (66) Grand Final. “It is a relief really. 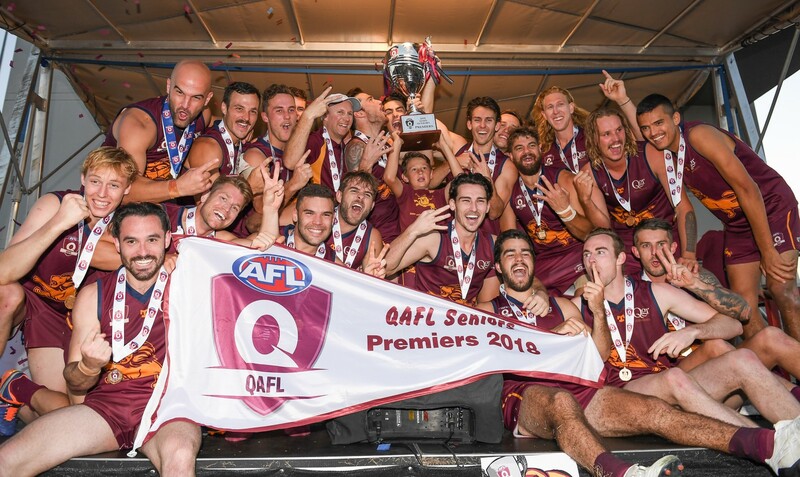 There’s a lot of teams that finish at the top of the ladder that don’t go on to win the Grand Final,” Owens told aflq.com.au following the game. The motto of Palm Beach Currumbin is local, loyal, family, and according to Owens, the Premiership triumph was a culmination of all of that. “We have two Emblems, two Thynnes, two Harrisons, Nick Crowley and his dad Jack is an assistant coach, Tyler Cornish and his mum is our President; AJ Dawson played in the seniors and his brother played in the Colts – it really is just a family club,” he said. It wasn’t long until the reigning premiers were on the board and it was their star forward John Anthony who drew first blood. Papaua New Gueneia native Hewago Oea soon got the Cats on the board and it soon became evident the away side wouldn’t bow to the minor premiers. The newest name in the Grogan Medal fraternity, Blake Erickon, quickly added Broadbeach’s second major of the game before Jarryd Douglas etched his name onto the Lions’ scoresheet with his first. The two sides continued to trade the lead on the scoreboard for the remainder of the term as Thomas Thynne, Oea and Caleb Graham continued in the shootout. The second term began in bizarre fashion as the Cats were given easy use out of the centre courtesy of a free kick at quarter time. Despite their easy clearance, the Cats couldn’t increase their lead on the scoreboard and following th blitzkrieg opening stanza, it wouldn’t be until the 17th minute for the first goal of the second term to be scored. The Lions went coast to coast after a Matt Fowler miss at one end, resulting in Jack Anthony’s second major of the game. He propped up again minutes later to extend the Lions’ lead to eight points as he again became the beneficiary of the Lions’ quick ball movement in midfield. After going goalless for the second term, Broadbeach’s woes continued early in the third term as Anthony added his fourth after taking a huge contested grab amid a sizeable pack of players. As he had done for most of the opening half, Oea, a Gold Coast SUNS Academy product, willed the Cats ahead and mounted the side firmly on his back. He booted his third goal halfway through the term to break the Cats’ goalless drought and reduced the margin to just 14-points. The biggest moment of the third term came in the 20th minute, when Cats’ forward Luke McGuane took a lonesome mark on the wing. But just as a Cats’ score seemed eminent, his subsequent kick – into the corridor – was turned over and the Lions made the most of it; kicking a goal through Jason Burge. Broadbeach, despite their struggles, had a genuine opportunity to reduce the margin to within three goals late in the term, but ruckman Matthew Conroy mustered nothing on the scoreboard – his shot sailing out on the full. Instead, it was Fowler who but the margin to 21-points as the two sides parted for the final change. A stoppage inside the Lions’ forward 50 allowed Anthony to boot his fifth major of the game, with the former Collingwood and Fremantle player snatching the ball out of the ruck before snapping truly. Lions’ co-captain Thomas Thynne booted his second major of the game to all but seal the premiership midway through the term before the Lions’ piled on two more goals in extra time just for good measure. John Anthony was awarded the Joe Grant Medal as the game’s best player after starring for the Lions inside 50. “It’s unbelievable. We had the belief and the reward is a premiership,” Anthony said. Hewago Oea was instrumental early for the Cats with a team-high three goals from the wing as his speed and precision made him the most dangerous player on the ground early. His impact in the second half waned slightly after receiving heavy attention from Lions’ stopper Curtis Marsden. GOALS, Palm Beach Currumbin: J. Anthony 5, T. Thynne 2, J. Douglas 2, Z. Harrison 1, J. Burge 1, C. Graham 1, J. Derrick 1, T. Cornish 1. Broadbeach: M. Fowler 3, H. Oea 3, J. Searl 1, R. Blood 1, B. Erickson 1. BEST, Palm Beach Currumbin: tbc. Broadbeach: H. Oea, B. Neal, B. Erickson, R. Dienjes, E. Panozza, D. Eames.